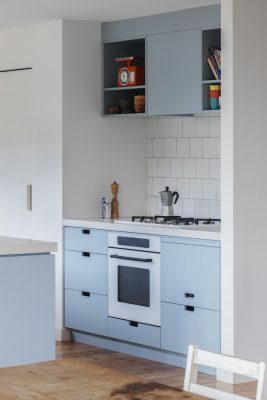 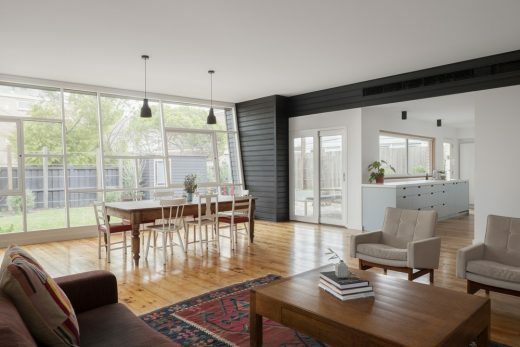 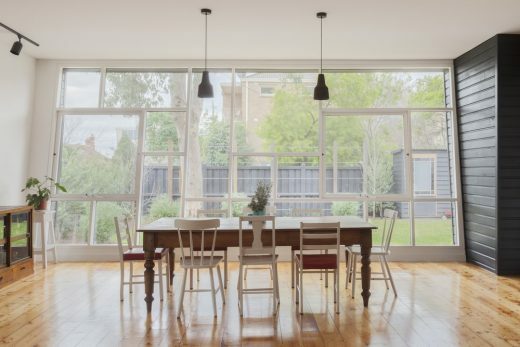 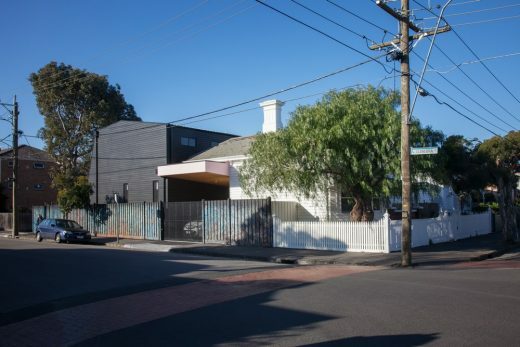 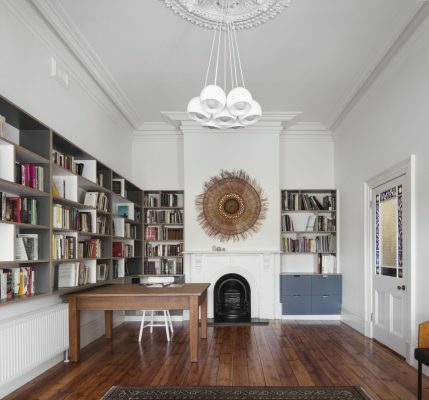 This project involved the re-configuration and extension of an Edwardian weatherboard house in the Melbourne suburb of Balaclava to provide for the evolving needs of a young family. 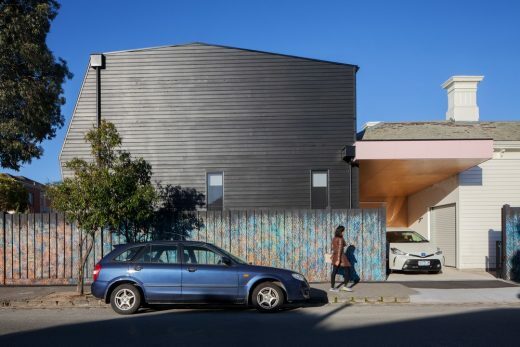 Located on a prominent corner within the neighbourhood, the design leverages the opportunities of its multiple frontages and its condition of being experienced ‘in the round’ to animate and engage with the streetscape. 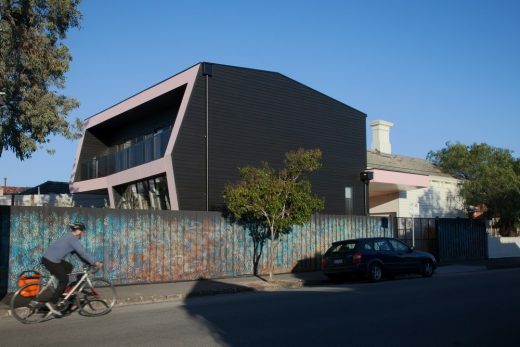 The organisation of the house is expressed in ‘black and white’ on the west elevation which faces the side street, with its didactic expression of the relationship of new and old. 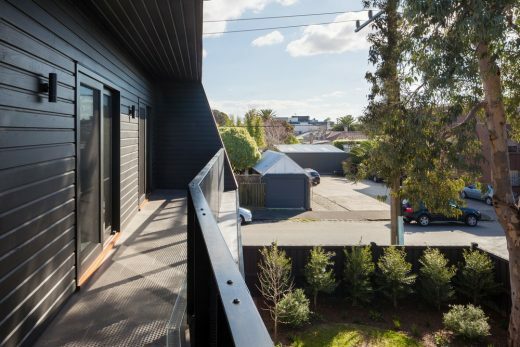 The new extension is a deformed box, clad in timber and stained black to contrast with the original, white weatherboard Edwardian cottage at the front. 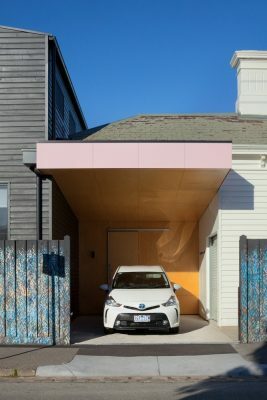 A plywood canopy folds into the side of the original house to carve out a carport: serving to conjoin the two main volumes of the house. 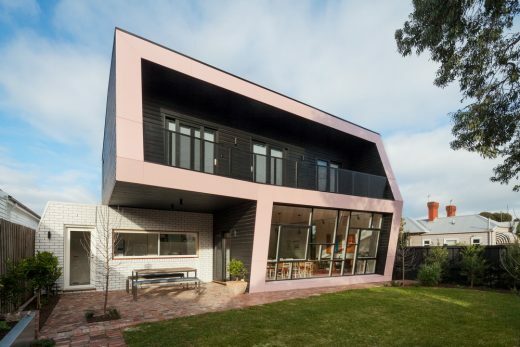 The north façade registers the sectional profile of the spaces behind, expressed by a pink fascia ribbon that frames the life within. 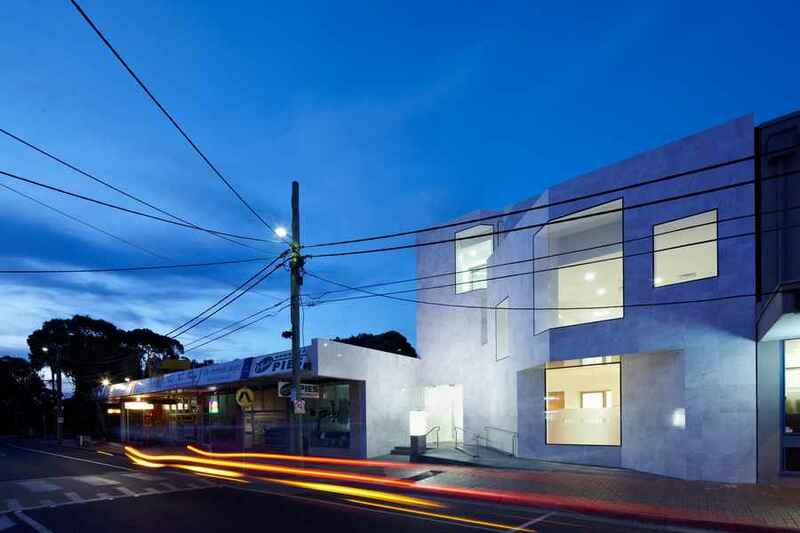 The massing of the extension responds to various parameters. 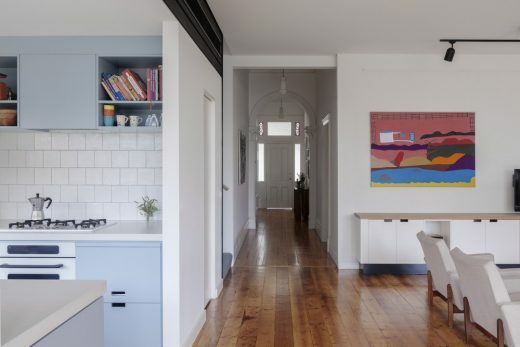 Rather than a dumb box at the back of the house, it seeks to complement the original house by drawing on the form and geometry of the bay window and the roof-form. 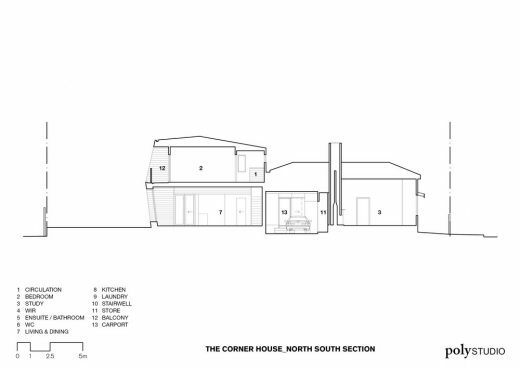 The extension is pushed down on the south to minimise its visual impact on the original house. 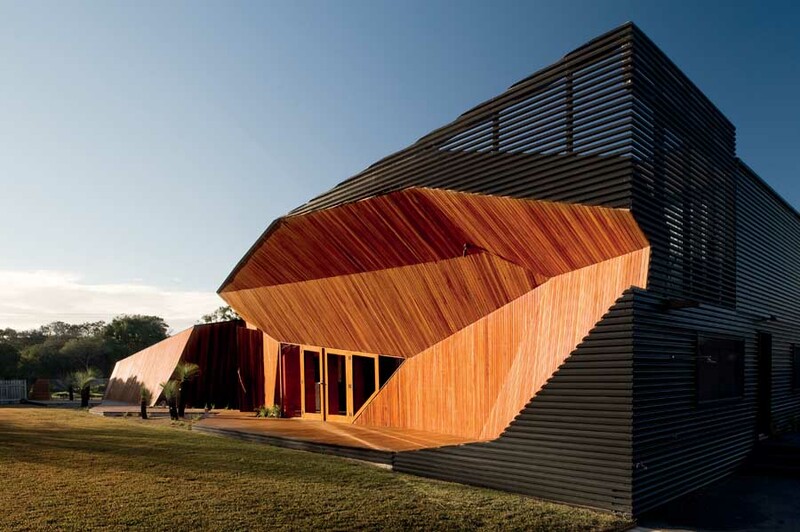 The form on the northern face is shaped to incorporate solar control – effectively forming a self-shading facade without the need for applied sun shading. 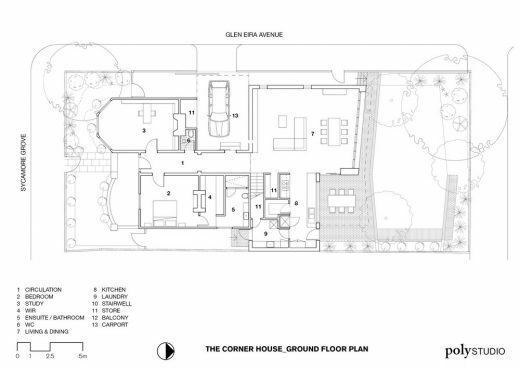 The internal planning of the house has been structured around a series of separate zones. 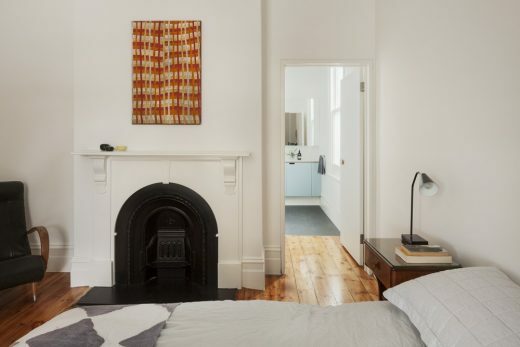 The original house at the front comprises a parents’ zone including the master bedroom with WIR and en suite bathroom as well as a generous study / home office. 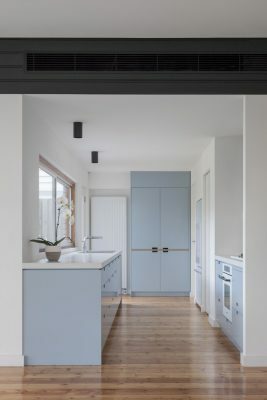 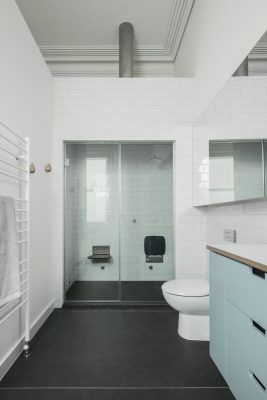 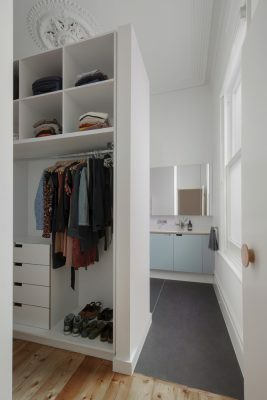 The ground floor of the extension comprises a living and dining zone connected to the kitchen and laundry, oriented to the north and opening out to the garden. 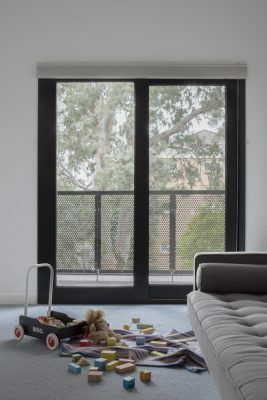 The third key zone occupies the first floor of the extension and comprises the children’s bedrooms which are oriented to the north and open out onto a shared balcony overlooking the garden. 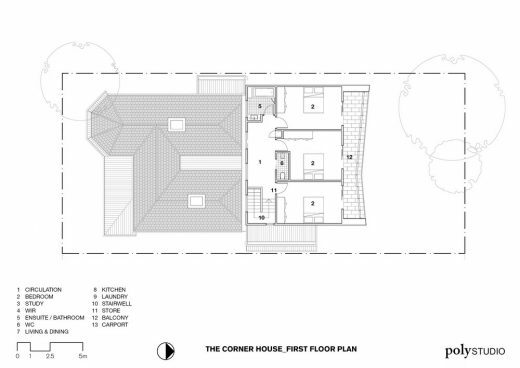 Off street parking has been located within the footprint of the original house which creates a highly efficient floor plan that maximises the size of the back garden. 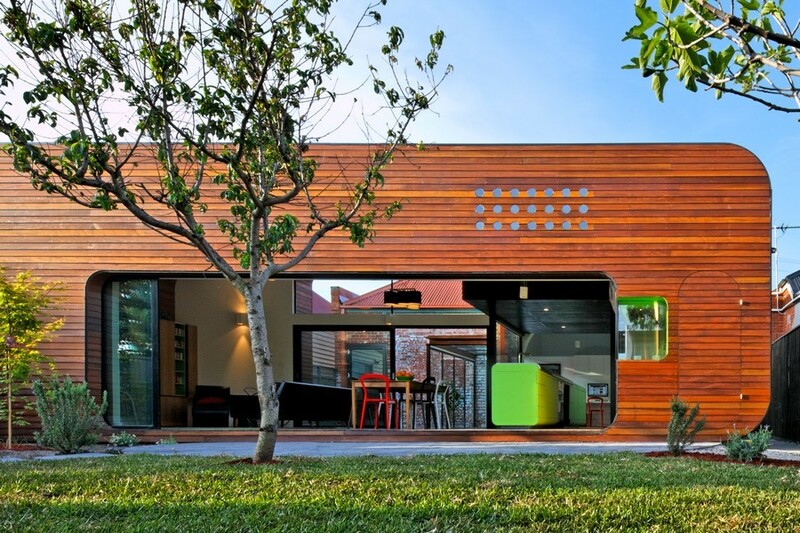 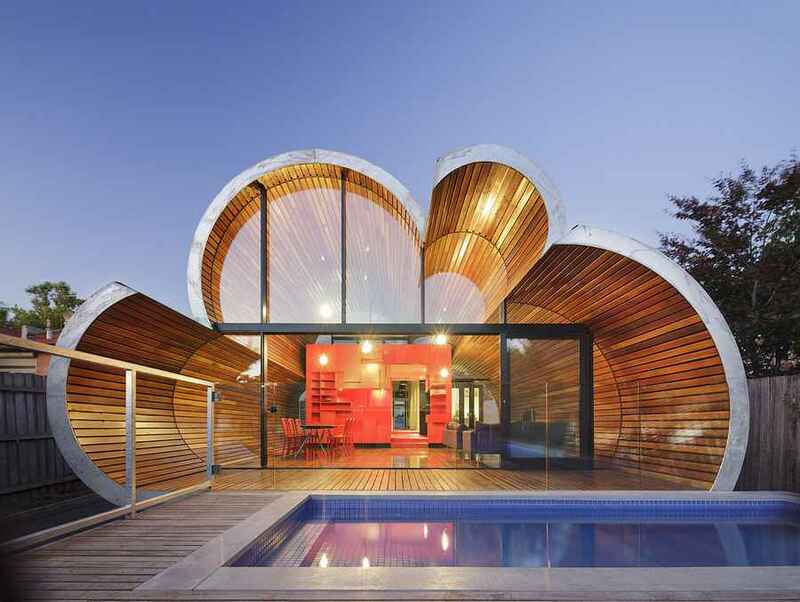 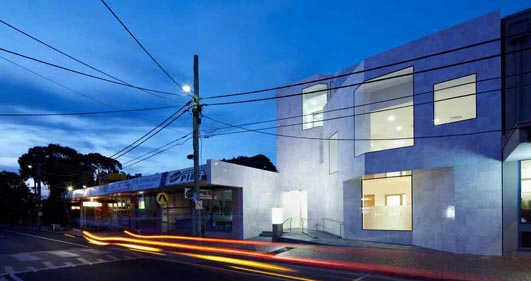 The house has also been designed to incorporate passive design principles. 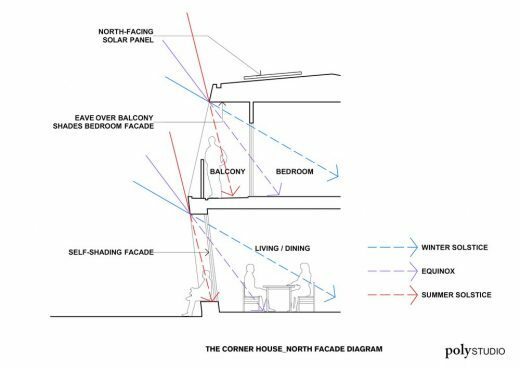 Key rooms and spaces are oriented to the north with effective solar shading, with a minimisation of windows facing east and west. 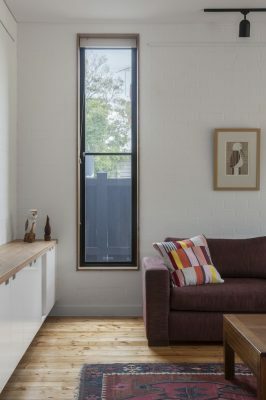 Windows have been strategically located to encourage cross-ventilation. 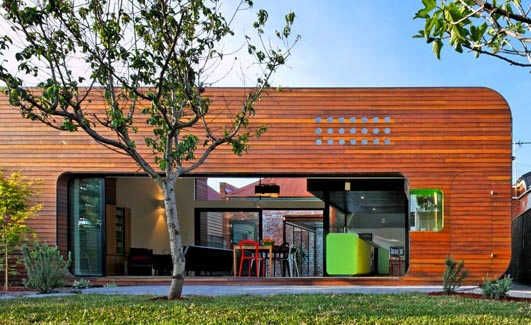 Reverse brick veneer construction has also been adopted in the living space to incorporate thermal mass into the house.